SSC provides individualized coaching to help you move from insight to action. We offer a confidential, non-judgmental and safe space where you can connect with your sense of purpose, fully articulate your goals and tackle any challenges that are getting in the way of leading a fulfilling and purposeful life. Whether it’s a leadership challenge, life-work balance issues or the desire to explore new opportunities, we help you embark on a journey of self discovery that can spark deep insights and lead to transformational change. We utilize a broad array of techniques and tools to help you fully connect to your sense of purpose, clarify what’s really important to you and then help you craft the right strategies to achieve your goals. New executive directors often face multiple challenges and competing priorities. SSC has developed an intensive six (6) month coaching program aimed at helping new executive directors build their confidence and exercise sound leadership. Build the leader’s confidence and emotional intelligence in order to inspire and align diverse stakeholders in support of organizational goals. In partnership with the Cricket Island Foundation, we have pioneered a new leadership development program that combines leadership training and peer learning labs with individual and group coaching in order to achieve maximum results. Based on 15 years of coaching individuals and teams in the social change sector, SSC is available to design and facilitate customized Leadership Learning Circles for grantee cohorts. Utilizing a peer learning and coaching methodology, SSC offers a combination of tools and techniques to enhance leadership skills and resiliency. 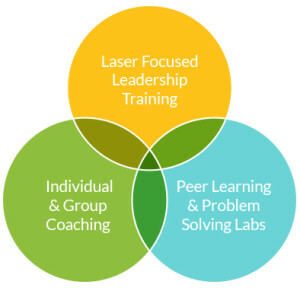 Peer Learning and Coaching: Participants are trained in peer coaching techniques and engage in strategic thinking and change management dialogues with each other. Each participant has the opportunity to present real life challenges for group discussion and problem solving. Each session is planned and facilitated by a certified coach. Assessment and Problem Solving Tools: We provide participants with a comprehensive array of tools and techniques to advance their leadership skills which they can also share with emerging leaders in their own organizations. Our tools are specifically designed to fit the culture and ethos of social change organizations. Participants can access a range of leadership and team assessment instruments, emotional intelligence assessment tools, context mapping worksheets, change management flow charts, scenario thinking and decision-making frameworks, to name only a few. Leadership Training Seminars: After assessing cohort needs, we design a series of training seminars focused on the leadership topics most important and necessary for cohort members. These may include laser-focused seminars on strategic planning and thinking, change management, building emotional intelligence skills and articulating your leadership vision and stance, etc. We also provide participants with a library of change management and leadership development articles, tools and exercises to augment the learning process. Individual Coaching for Integration: Each participant selects an individual coach that provides coaching throughout the program in order to help leaders develop a comprehensive leadership plan with specific learning objectives and skills development goals. We utilize a Skills Transfer and Integration Approach (STIA) to achieve maximum benefit. Our coaches work with each leader to maximize integration of new skills into their daily leadership practice. SSC also designs customized Leadership Team Coaching programs and Leadership Intensives (1–2 day retreats) to address specific organizational needs such as managing conflict or crisis, managing rapid organizational growth, the need for restructuring or changes in strategic direction.